My name is Chris Michaels. I currently manage the Herpetology team at ZSL London Zoo. Like so many people in our field, I started young with amphibians, pond dipping and rock flipping wherever I went and building up a collection of animals at home. Very quickly I found that my true love was salamanders, especially salamandrid and hynobiid species from Asia. In the future, I hope to continue working in zoos and have particular interest in ensuring that living collections reach their potential to contribute to protecting amphibians through research, education and direct conservation intervention. 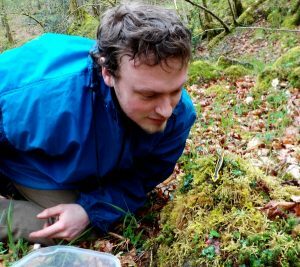 An obsessive hobby and a Bachelor’s degree from the University of Oxford landed me a government funded PhD studentship in the Preziosi lab group at the University of Manchester. Over three years I established and worked with captive populations of anurans, caudates and caecilians studying the effects of captive conditions on fitness and their implications for reintroductions. I also looked at the interplay between field and captive aspects of amphibian conservation and how they can be combined. Much of this work was published. While studying for my PhD, fellow doctoral student Rachael Antwis and I established the Amphibian Conservation Research Symposium (ACRS), an annual conference now affiliated with the ASA (Amphibian Survival Alliance) that has become an important part of the amphibian conservation calendar and with which I am still heavily involved. During my doctoral write-up period, I accepted a job at ZSL London Zoo in the Herpetology Section. I had always been interested in working in zoos and in using captive collections to address the conservation needs of amphibians through research, education and on-the-ground conservation measures. At ZSL I currently manage the Herpetology team, which maintains a large collection of reptiles and amphibians. We work to develop exhibits that raise awareness for the conservation plight of amphibians, and to highlight conservation initiatives in which ZSL is involved. Our displays and outreach work also engage the public in amphibian and reptile conservation. 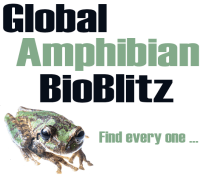 Research is a key component of zoo work, and, working with colleagues, I have published on amphibian species biology, conservation strategy and taxonomy. Particular areas of interest include the role of zoos in conservation breeding programs, the application of field data to captive husbandry protocols, and the effect of captivity on the fitness of amphibians. This scientific work has been supplemented by independent peer-reviewed publications from my private collection, which still includes species I kept as a teenager! At ZSL we currently work with several amphibian species of conservation interest, often in close association with ZSL’s EDGE of Existence program (www.edgeofexistence.org) and colleagues from other areas of ZSL such as the Institute of Zoology and Conservation Programmes. 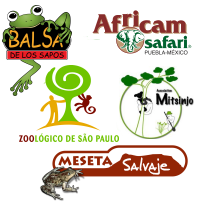 These include projects with wild and captive amphibians, and also a combination of the two. Key foci for me are Mexican ambystomatid salamanders (working closely with Alfredo Hernández Díaz from Africam Safari), Cameroonian Highland endemics (with a particular focus on the Lake Oku Clawed Frog (Xenopus longipes)), Chinese giant salamanders (Andrias davidianus), the UK-native Pool Frog (Pelophylax lessonae) (as part of the reintroduction project undertaken by Amphibian and Reptile Conservation and partners), Mountain Chickens (Leptodactylus fallax), and Alytes midwife toads. The latter, while being of conservation interest in their own right, form a model system of phylogenetically close, but ecologically dissimilar, species that we use for a number of research projects concerning husbandry and amphibian biology. Alongside species-focused projects, I have also contributed to the review and implementation of the IUCN’s Amphibian Conservation Action Plan and delivered husbandry training courses and support for other institutions working with amphibians.